In Ancient Egyptian mythology, Meskhenet, (also spelt Mesenet, Meskhent, and Meshkent) was the goddess of childbirth, and the creator of each child's Ka, a part of their soul, which she breathed into them at the moment of birth. She was worshipped from the earliest of times by Egyptians. In ancient Egypt, women delivered babies while squatting on a pair of bricks, known as birth bricks, and Meskhenet was the goddess associated with this form of delivery. Consequently, in art, she sometimes was depicted as a brick with a woman's head, wearing a cow's uterus upon it. At other times she was depicted as a woman with a symbolic cow's uterus on her headdress. Since she was responsible for creating the Ka, she was associated with fate. Thus later she sometimes was said to be paired with Shai, who became a god of destiny after the deity evolved out of an abstract concept. It was said that Meskhenet was present at the birth of triplets, and foretold in their fates, that they would each be pharaohs - the triplets in question were Sahure, Userkaf, and Neferirkare Kakai, who were the first pharaohs in the fifth dynasty (although Userkaf was not the sibling of the other two, but their father). 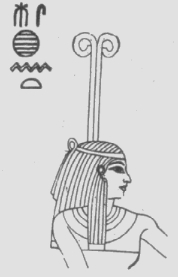 Meskhenet also was believed to be the earliest wife of Andjety the god of rebirth in the underworld. Andjety appears to have been worshipped since pre-dynastic times at Andjet, and is thought by most Egyptologists to be the god who eventually became Osiris. Meskhenet was a goddess who presided at child birth. In her form of a tile terminating in a female head (called in the Book of the Dead "cubit-with-head") she represents one of the bricks upon which women in ancient Egypt took a squatting position to give birth. Her presence near the scales in the hall of the Two Truths, where the dead person's heart is examined and weighed to ascertain suitability for the Egyptian paradise, is there to assist at a symbolic rebirth in the Afterlife. Her symbol of two loops at the top of a vertical stroke has been shown to be the bocornuate uterus of a heifer. In addition to ensuring the safe delivery of a child from the womb, Meskhenet takes a decision on its destiny at the time of birth. In the Papyrus Westcar the goddess helps at the birth of the future first three kings of the 5th Dynasty. On the arrival of Userkaf, Sahure and Neferirkare into the arms of Isis, she approaches each child and assures it of kingship. Similarly she is the force of destiny that assigns to a scribe promotion among the administrators of Egypt. A hymn in the temple of Esna refers to four "Meskhenets" at the side of the creator god Khnum, whose purpose is to repel evil by their incantations.